A great list of Instant Pot Recipes for Beginners. From appetizers to main dishes, this list has something for everyone! This list offers a wide range of cuisines to meet taste preferences for everyone. Diets included in this roundup are Vegetarian, Vegan, Gluten-Free, Dairy-Free, Low Carb and Keto as well as recipes with meat as the star. One of the things that I love most about my Instant Pot is that I have made meals in it that I would have never attempted overwise. Using the Instant Pot encourages you to try out new spices, seasonings, and even cuisines! There are so many people out there that love their Instant Pot/Pressure Cooker and state that they would have never thought they could make what they have in their Instant Pot! Using an Instant Pot shouldn’t be complicated. One of the most loved things about a pressure cooker is that it’s faster than using a slow cooker (of course, right?) and that it doesn’t need to be babysat while cooking. When cooking on the stovetop, it requires standing by the stove, adding ingredients, and stirring. 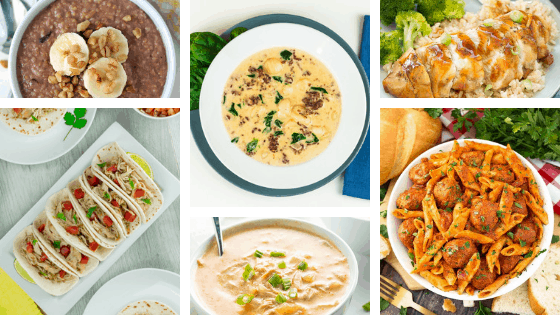 With most of these Instant Pot recipes, it’s as simple as adding the ingredients into the pot, closing the lid, and starting it! The meals including meat often require sauteeing first to brown the meat and lock in flavor. It’s also a good idea to drain the grease from the meat to reduce the amount of fat in your recipe. A lot of people use 80/20 or 93/7 lean beef when cooking in their Instant Pot and don’t drain. It’s really just a preference, though! There are many Instant Pot accessories out there to choose from, but how do you know what you really need? Well, it depends on what you make! 7″ Springform Pan – Great for cheesecake, lasagnas, cakes, and more. The Springform pan is also great for making “pot in pot” recipes! Pressure Cooker Sling – perfect for lifting pans out of the Instant Pot hassle and burn-free! Steamer Rack– The steamer rack comes in handy when making vegetables and even whole chicken! Extra Silicone Rings for 6 Qt. – Sometimes the sealing rings of the Instant Pot wear out and causes issues with sealing. Other times, they absorb smells of the food you’re cooking and it’s nice to switch them out! Extra Silicone Rings for 8 Qt. Due to busy lifestyles, people often sacrifice healthy food for convenient food. Making meals in the Instant Pot helps to keep families on a balanced and healthy diet. The Instant Pot can cook frozen meats and even food whole meals in the Instant Pot with no additional cooking time as if you were making the meals from fresh. There are many “less than 30 minutes” meals out there to choose from, and many of them are kid-friendly and healthy! The Instant Pot makes meal prep easier because you can make ahead your dinners and freeze them. Simply add the ingredients into the appropriately sized bags (may need to reshape and freeze to make it easy to add to the pot when frozen!) and put them in the freezer. No more worrying about forgetting to lay out dinner, it’s one of my favorite things about my pressure cooker! Below is a list of easy and delicious recipes to help get you acquainted and comfortable with your pressure cooker. These are tried and true recipes and there is a wide variety to choose from! A great tutorial on how to make different types of rice - perfect for beginners! This easy and simple vegan and gluten-free Instant Pot Cauliflower has just 4 ingredients! A delicious and easy dump and start Instant Pot recipe for beef barbacoa tacos that can easily feed a crowd! Easy to follow vegetarian recipe for fajita pasta - yum! A simple, easy to follow recipe for Mongolian Beef in the Instant pot. This Panda Express copycat for Orange Chicken is made in the Instant Pot and is easy to make. Simple recipe to follow whether you're making this honey garlic chicken from fresh or frozen. Kid friendly and easy to make Hamburger Mac and Cheese. Converted from a slow cooker recipe to be made in the Instant Pot - you'll never make pulled pork in a slow cooker again! Instant Pot Sweet and Savory Pulled Pork that is ready to eat in less than an hour! This recipe is great for large crowds or barbecues! Flavorful and tender low carb and keto pot roast. Dump and start fajita recipe ready in less than 30 minutes! Instant Pot recipe for buffalo chicken soup that is low carb and ready in less than 30 minutes. Made with just a few ingredients, this pulled pork is very flavorful! Easy to follow recipe for zuppa toscana! Keto and Low Carb beef and broccoli ready in 20 minutes. Made with brown rice, this dump and start enchilada rice is easy to make. A delicious twist on classic chili – Creamy white chicken chili made in the Instant Pot. Steel cut oats in the Instant Pot - vegan and gluten-free! Comforting and hearty tomato soup made from scratch. This Olive Garden favorite is made using the Instant Pot. The familiar flavors of this favorite dish are duplicated in this Instant Pot Chicken and Gnocchi Soup. Gluten and dairy free Instant Pot beef stew. Baked Potatoes have never been easier with this Instant Pot recipe! This Easy Instant Pot Taco Soup is made with simple ingredients and it makes enough to serve a large crowd. It’s great for parties and it’s a crowd pleaser! it's also a dump and start! Simple ingredients and kid-friendly! Perfect for a quick dinner! Homemade refried beans couldn't be simplier using the Instant Pot. This incredibly easy dump and go Minestrone Soup is made in the Instant Pot and is an Olive Garden Copycat.